Minimalist Monday: Ask yourself, Can I Do Things Differently? I often think of this quote when I'm facing the same problem over and over again and ask myself, Can I do things differently? Change takes time but recognising that things aren't working is the first step. At least it means that you've recognised that you've got a problem and you're beginning to work out a solution to it. And that's better than burying your head in the sand. I'm a firm believer in baby steps. Just taking a few minutes each day to work towards your goal will help you to eventually take some bigger strides towards achieving your dreams. It worked for me when I first considered downsizing to a smaller home and seeking part-time work. The baby steps were all about thinking things through and searching for alternatives. Asking myself not if I could downsize or work less hours but how I could achieve these things. Minimalism is all about questioning the different things in your life from your possessions to your work life balance and then taking practical steps to eliminate the barriers to your dreams. Whatever the problem whether it's a big one like moving house or a smaller one like how to fit more exercise into your week doing things differently or thinking things through differently can work. Could you try a new type of exercise? Exercise at a different time of day? Reward yourself in a different way? 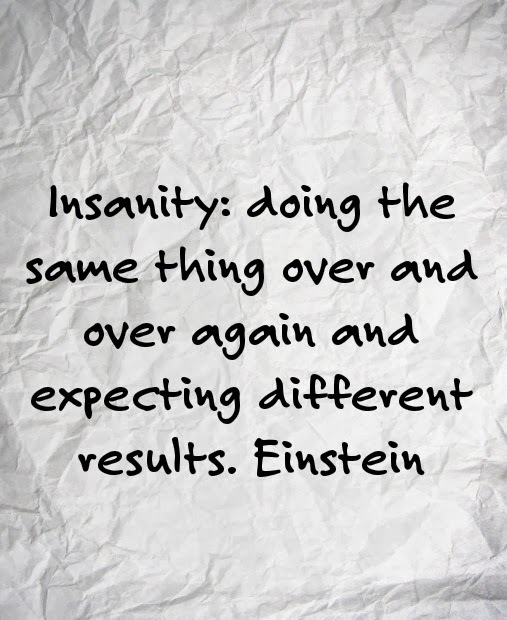 I believe you can get the results you want if you are prepared to do things differently and to think differently too. It can mean challenging yourself about how you have acted in the past and also not worrying about what others think of you. It's never too late to do things differently. A great post - it has given me food for thought, and reminded me - start now. Thank you. I do the same thing over and over sometimes because sometimes what happens changes. It doesn't always stay the same at all. I love the great prompts and ideas I have gotten from your posts ! Thank you for this, I really needed to read this, you're so right, it's all about baby steps and I can't expect anything to happen over night! I have seen that quote before, I didn't realize it was Einstein that had said it, I just read a book on him a couple of weeks ago, a very fascinating man!